Formula One is a sport of function over form if there was one, and the form Force India’s new VJM10 Formula One racer certainly could’ve turned out better in the front—or maybe not, according to Autosport. The VJM10's unique bump in its nose had to be there in order to exploit a certain part of the suspension rules. ﻿We have tried to exploit an area of the front suspension regulations that improved the characteristics of it from a mechanical perspective. It does mean that because of the way the regulations are worded, we cannot merge it into the nose as we would like. There is an exclusion box that we have to respect, so unfortunately we end up with a little bit of a “forehead,” as it is called. 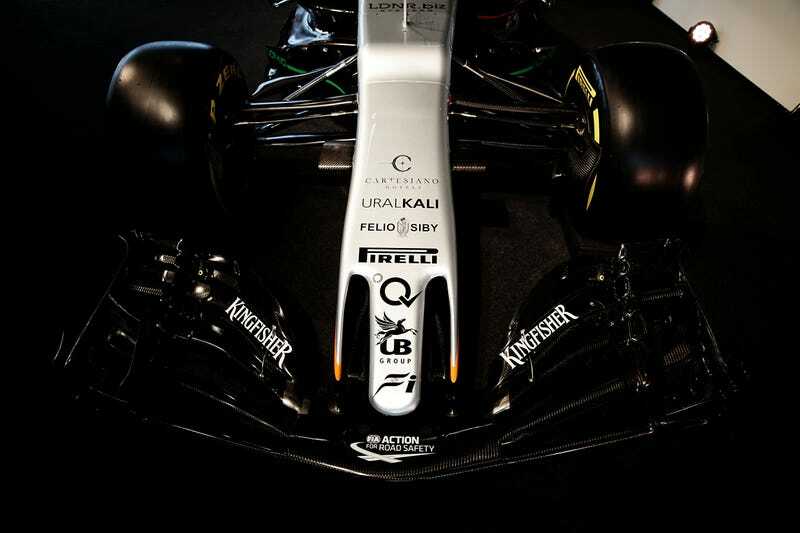 Part of the 2017 “formula” for Formula One mandates certain dimensions in certain spots, and unfortunately for Force India, their suspension design wouldn’t let them have a smooth nose. ﻿It is a different looking nostril as we had last year - the same philosophy. We just opened it up a little bit more. The nostrils allow more air through to the underside of the chassis. All we know is, if it works, it works. And if it’s fast, we’ll see a lot more copycat suspension and nosecone designs show up with similar-looking foreheads and nostrils.